The chapel at Mill Hill School was designed by Basil Champneys and completed in 1898. 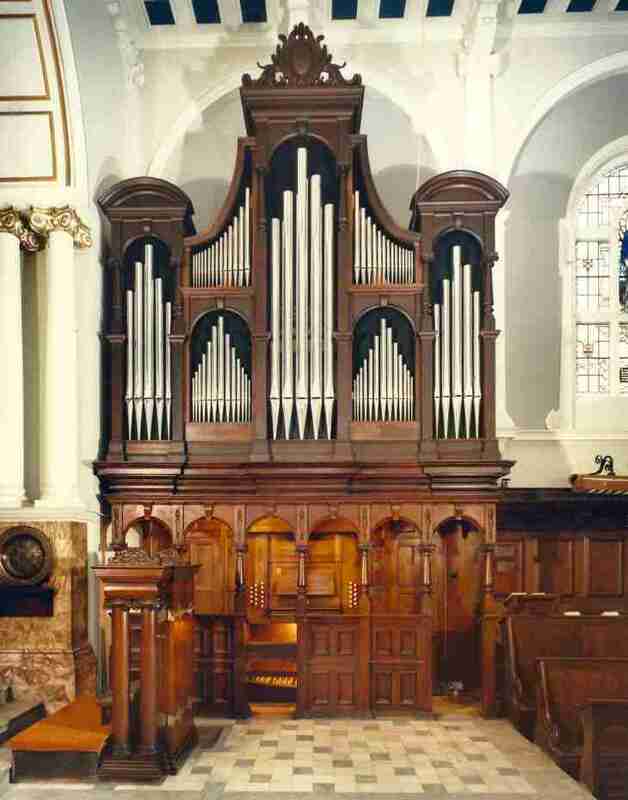 The unusual organ case formed part of the original furnishings, and shared their Italianate influence, but fell short of being a complete success - as indeed did the first organ. Built by Vowles of Bristol, and later rebuilt by Compton in 1958, it was inaccessible, unreliable and uninspiring. When the opportunity came to build a new organ, we decided to keep the existing case, but to remodel it in order to remove the more eccentric features. Principal changes included the remaking of the centre tower so as to be straight, rather than semi-circular, in plan, and the redesigning of the upper and lower flats, with new curved sections of roof where previously had been bare pipe tops. The display pipes, of burnished tin, were new, and the console was returned to the proper position "en fenêtre". Inside, all of the organ is entirely new. The key, pedal and drawstop actions are all mechanical, the manual departments having 'suspended' action. The winding is traditional, with three large bellows. The tremulants are of the Dom Bedos 'tremblant doux' design. There are two adjustable composition pedals to each department. The Swell is mounted above the Great in the main case, and the Pedal is at ground level behind, in the original organ chamber.